When you are ready for an adventure with the comforts of home, then hop in this Prime Time Tracer travel trailer! 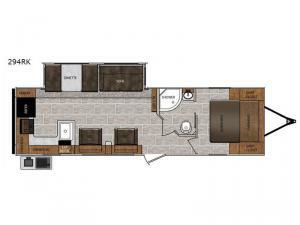 Model 294RK offers a rear kitchen layout with plenty of counter space and appliances to whip up any meal, and a pantry to store your favorite camping snacks. You can even choose to cook outside on the outdoor kitchen and you will stay protected from the sun's rays with the 19' power adjustable awning with LED lights. There are plenty of seating options between the two recliners, the sofa, and the booth dinette. The single slide out provides more floor space in the main living/kitchen area which is nice when everyone is inside for meals. You will also enjoy having access to the dual entry bath from the front private bedroom, as well as the Evergreen select foam queen mattress!